They’re more than just for spritzers or to satisfy your sweet tooth. Crisp, tart, aromatic and expressive, the different types of white wines are as much of a journey for your palette as they are a tour around the world. However, many still assume that all white wines are too flat or too sweet — or worse — somehow not as sophisticated as reds. White wine types are cultivated in every single wine-growing region around the world for a reason. With hundreds of varietals and variations, each of the many kinds of white wine showcase a range of smells, sights and tastes unmatched by other drinks. What Are the Different Types of White Wine? Our overview of white wines is here to change such misconceptions. From everyday favorite picks to niche varietals even white wine experts don’t see on the regular, we’ve put together a summary of the main types of white wine, as well as what to look for in a glass and what to pair with each. When most people think of white wine, they typically conjure the smells, flavors and features of one of its textbook classics: chardonnay. Chardonnays are a model varietal to top the list of white wine types. Native to the legendary Burgundy regions of France, this green-hued grape grows universally today but thrives in colder climates such as the Pacific Northwest, New Zealand and South Africa. Some of today’s most popular chardonnays are cultivated in Napa and Sonoma Valley, readily accessible for passionate and novice white-wine drinkers alike. Chardonnay-growing vineyards rely upon many fermentation tweaks to soften its natural acidity into gentler, silkier notes. Most prominent is the malolactic method, which is responsible for adding chardonnay’s noticeably light and creamy aftertaste. Many have even likened this white wine type’s flavor to butter or toffee. You can expect pops of green apple, lemon, pineapple and celery in your chardonnay, rounded out by the candy-like coconut or caramel finish. Chardonnays can fall on the sweeter or dryer side depending on the type, though their unique finish helps keep it from becoming too flat or dessert-like. If you’re interested in a more fruit-forward, light chardonnay, opt for a bottle that states “un-oaked” or “no oak.” Likewise, those smooth, buttery finishes will come more prominently in Old World chardonnays that have been oak-aged, per tradition. Another popular type of white wine known around the world, rieslings offer a diversity of flavor profiles that can suit nearly any drinker’s tastes. That’s because this white wine varietal comes in many forms, from the late-harvested sweet Mosel Valley varieties to their dryer, crisper French and Washington State riesling counterparts. Riesling grapes are highly fragrant and can be manipulated for tart ripeness or held on the vine for a more refined, longer-lasting finish. Either way, rieslings maintain a sharp, high acidity and fresh, unlingering body whether made to be sweet or dry. Rieslings are generally on the thinner side, not high in alcohol and not likely to overtake the tastebuds when sipping alone or pairing with food. They do best without much fermentation or oak influence during the aging process, making this a slightly different white wine varietal in that they can be harvested, bottled and then left to age without much fuss. This type of white wine carries notes of honey, lime, apricot, green apples, and earthy minerals. The older the bottle, the dryer and deeper the flavors tend to run, as riesling grapes ripen quickly on the vine and can’t fully develop naturally complex flavors. Serve riesling on the chilled side, between 45 and 50°F. Pinot grigios and pinot gris are the same grape varietal grown from the same grape mutation. The naming confusion merely arises from language, as Italians cultivate and call it grigio, while their neighbors to the north — the French — dubbed it the shortened gris. Pinot grigios are incidentally a younger cousin to the similarly named pinot noir, a wildly popular red wine type. The two carry complementary olfactory notes – dry, woodsy and even floral on the nose. 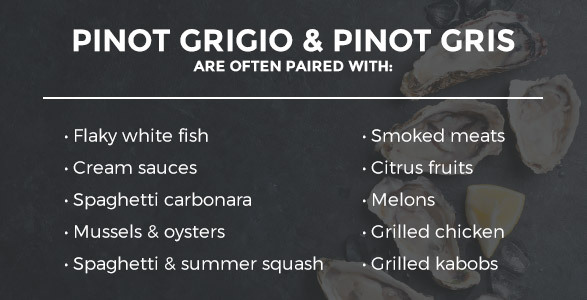 Interestingly enough, pinot grigio and pinot gris grapes are a foggy gray-purple color — a surprising twist for a white wine varietal that harkens to its red origins. Pinot grigios carry a distinctly heavier texture compared to other white wine types on the list. Sips will coat your tongue with an oilier, velvety feel best described as unctuous. This heavier body doesn’t necessarily mean a heavier drink, though, as grigios and gris both still contain the light, bright notes white wines are notorious for. It merely turns the dial up, asserting the earthy with the sweet and finishing with a refreshing rather than in-your-face tartness. Those who enjoy heavier-bodied wines with slightly a less fruit-forward palette will appreciate pinot gris. A typical glass will have notes of lemons, white nectarine, jicama, clove and ginger. Serve pinot grigios and pinot gris “cold,” around 45°F. 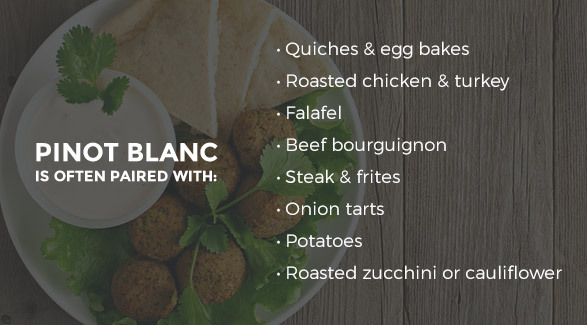 Continuing down the pinot family line, next on the list of white wine types is the pinot blanc. Famous in its home region of Alsace, France, and neighboring Austria, Italy and Germany, this white wine varietal is amongst the naturally dryest and most round-bodied in the family. While grigios/gris get lauded for their expressive pops of isolated flavors, a pinot blanc takes its time, with a medium-bodied presentation that blurs between sweet and smoky. The flavor difference with this type of white wine is a crucial qualifier. While still incredibly light, pinot blancs contain a notable muskiness, both on the nose and the tongue. The best pinot blancs will even take on nutty notes, as well. Their medium bodies don’t overwhelm with their unique mix of heavy and light flavors, however. You’ll find a glass of pinot blanc carries bits of pear, lemon and yellow apple mixed with star anise, walnuts, applewood and mulch. Pinots blancs finish on a slightly sour note due to its stable levels of acidity. Oak-barrel aging can tame this, which is a conventional treatment in pinot blancs from the United States, Canada and Argentina. Lighter versions aiming to stress the fruity and sour notes will skip any oak aging, though. Blancs with this treatment are traditionally sourced from northwest Italy, go by the name Pinot Bianco and have a lighter, brighter finale. People have strong opinions when it comes to sauvignon blanc. The reason? While the word “blanc” does translate from French as “white,” it’s one of the greenest-tasting types of white wine out there. It’s also one of the world’s most heavily planted, leading to a wide range of those proverbial earthy smells and sips. With some of the highest acidity levels and punchiest fruit notes, you’ll taste everything from grapefruit to fresh grass cuttings, elderflowers to marjoram, green pepper to tomatillo in a single sip. That sip, however, finishes dry. New World sauvignon blancs tend to be slightly more fruit-forward than those cultivated in France. This type of white wine varietal has taken particularly well to the cooler slopes of New Zealand’s vineyards, where sauvignon blanc accounts for 58 percent of the country’s wine acreage. The younger the blanc, the heavier the green or herbaceous notes — regardless of a vineyard’s country of origin. Allowing this varietal to ripen yields more pronounced and heavy-bodied waves like nectarine and peach to round out the savory notes. Overall, the best sauvignon blancs keenly balance the two — herby with fruity, silky with sour and intensely flavored with quickly finished. They continue to be one of the most popular and common types of white wines on the market today. You may not be able to say its name 10 times fast, but you can still enjoy this abundantly flavorful, albeit under-the-radar, white wine type — leaving you tongue-tied in more than one way. When it comes to taste, few wines are as tangy and floral as gewürztraminers. Even some of the most fervently popular types of white wines renowned for their sweetness don’t compare to the juiciness and garden-like flavors you’ll get in a glass of this French-German noble grape. Like the name might tease, gewürztraminers have a highly distinct set of flavors and scent profiles that draw you in even while you’re pouring a glass. Gewürztraminers are inherently aromatic grapes that trick the senses into thinking they’re sweeter and less acidic than reality, with some complex results. A glass of gewürztraminers will come with wafts of lavender and rose bouquets, followed by lychee, pineapple, strawberries and allspice. It is an ultra-light, refreshing and pleasantly spiced white wine perfect to drink on a warm summer afternoon. It may be the darling of sweet-toothed white wine drinkers everywhere. But muscat and moscato wines have a storied history anyone looking to increase their white wine wisdom should know. Moscato has its claim to white-wine fame from its smooth pours and languid sugary sweetness that dances in the mouth. It’s also one of our list’s lowest in alcohol content, with a typical moscato pour running 5 to 7 percent ABV. Muscat grapes grow best in warm climates, which is why the grape is typically cultivated around the Mediterranean and in some parts of Australia. Notes of orange blossoms, Japanese pear, lilacs and white cherries build its sweet profile without much acidity or residual tang. What’s more, white wine Moscato will also come in “still” or “sparkling” versions, with bubbles adding a textural element that’s great to enhance certain appetizers or mains. Semillion white wine is France’s third most-planted vine type. However, few know of its rich, complex flavor profile, have tasted it from a freshly uncorked bottle or have even spotted it on a menu. Flavor-wise, semillion grapes carry prominent herbaceous notes like a glass of sauvignon blanc while holding a body and acidity closer to a chardonnay. That is, flavors tend to stay longer on the tongue and roof of the mouth plus leave a more nuanced aftertaste than what’s experienced at first sip. 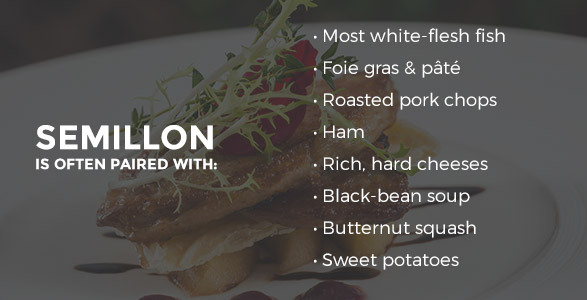 Some even describe semillion’s texture as oily or waxy, yet its flavors are paunchy and bright. It’s an impressive dichotomy hard to find in other white varietals. Don’t let words like “oily” deter you from exploring the rich and singular taste of both Old World and New World semillions. This white wine tends to carry a heavier, zestier flavor profile than other whites. Semillions cultivated in warm climates like South Africa and Argentina produce mango, papaya and white pepper bits. Cooler-climate varieties allow acidity levels to linger, tasting of lime, fig and ginger. Viognier is hardly ever the talk of the town, even though it’s one of the most prototypical of white varietals. For those drawn to the naturally lush, light, floral and acidic features so tied to white wines, viognier is heaven in a glass. On the nose, you’re hit with perfumed floral aromas that are bouncy and airy. These notes are enhanced by viognier’s full-bodied, full-fruit tastes that hit the roof of your mouth and stay there until your next sip. In many aspects, viogniers are the older, perhaps “nicer” twin sister to the chardonnay. Both their origins sweep back to ancient vineyards planted by the Romans across parts of their Eastern and Western Europe empires. But, viognier’s lush, low-yield grapes were considered the more rare and prized growth. That attitude has carried over into today, as viogniers only have about 30,000 acres of vines worldwide. Nowadays, you don’t have to be part of society’s gentry to find and enjoy good bottles of viognier. This type of white wine is soft and fruity, less weight on the tongue than other whites but bursting with juicy flavors of violets, pears, mangos, honeysuckle and tangerine. With less acidity than a chardonnay, though, you can expect these flavors to succeed with a smooth, clean finish with aftertastes dependent on if the bottle was age-oaked or not. Un-oaked viogniers will keep their peach-and-apricot-light finish, while those aged in oak temper fruity acidity to produce a spiced, semi-dry clove and vanilla finish. A glass of cortese is the perfect white wine to sip after a long day. It’s crisp, tart, structured and flavorful, hitting rounded notes of herbs, musk and fruit alike. It’s also yet another white wine that doesn’t get the praise it deserves — perhaps because of its highly regional growths and the limited number of vineyards that nail its temperamental nature. While cortese grapes are some of the highest-yielding vines in existence, they require a particularly warm atmosphere that lets their fruit slowly develop. This allows the grapes’ sugars to ripen and produce more complicated flavors, not merely lending a hit-and-run acidity punch. Too much warmth, however, and the cortese grapes reach maturity without this necessary sugar balance, striking more sour notes which must then be tempered with malolactic fermentation methods. The best cortese wines come from the Piedmont and Lombardy regions of northern Italy. A glass will have notably green or straw tints but pour smooth and clear, without much fizz or bubbles. Cortese checks all the white-wine flavor boxes, carrying flavors of lime, banana, passion fruit, mulch and campfire smoke. They’ll finish with an uptick of acidity that plays on the back of the tongue and stays there, all due to the wine’s viscosity and almost fatty feel in the mouth. Whether you’re looking to push your palette, expand your knowledge on all the different white wines out there or find a Rochester-area wine tasting, Marketview Liquor is here to help. Explore our white wines today, available for online ordering, or pick up in store if you are near our Rochester, NY location. We also offer free shipping on select bottles of six or more wines, as well as 10% mix and match case discounts – ideal if you’d like to try a few different wines at once, delivered directly to your door! There’s a story behind every bottle of white wine and a new world in every sip. Start experiencing them today.